Black resin case with a black resin bracelet. Fixed bezel. White digital dial. Dial Type: digital. Day. Quartz movement. Case dimensions: 57.5 mm x 53.9 mm. Case thickness: 20.4 mm. Round case shape. Tang clasp. Water resistant at 200 meters / 660 feet. Functions: day, hour, minute, second, shock resistant, LED backlight, alert, world time, 3 alarms, stopwatch, countdown timer. Sport watch style. 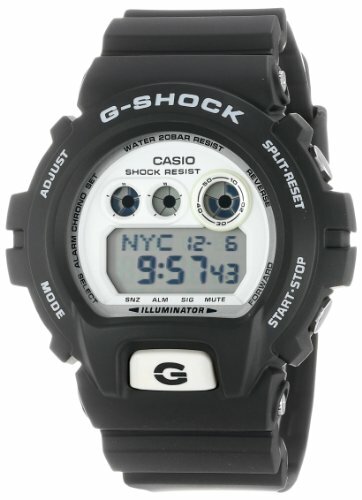 Casio G-Shock Digital Dial Black Resin Strap Mens Watch GDX6900-7CR.